The canyon is quiet this time of year as anglers shift their focus to west side Steelhead streams and holiday distractions. A few hardy souls still seek the last flashes of chrome in the desert on the John Day River, but soon the flows of ice will push them west as well. Trout feed on midges and the sporadic hatches of small Mayflies, but winter Trout anglers are a much smaller tribe and so the river returns to the resident population. Big Horn Sheep come down from their perches high on the canyon walls to graze on the new shoots of grass pushing up on the lower slopes and river bank. Their numbers have increased dramatically over the last 10 years and they seem to outnumber the deer population. 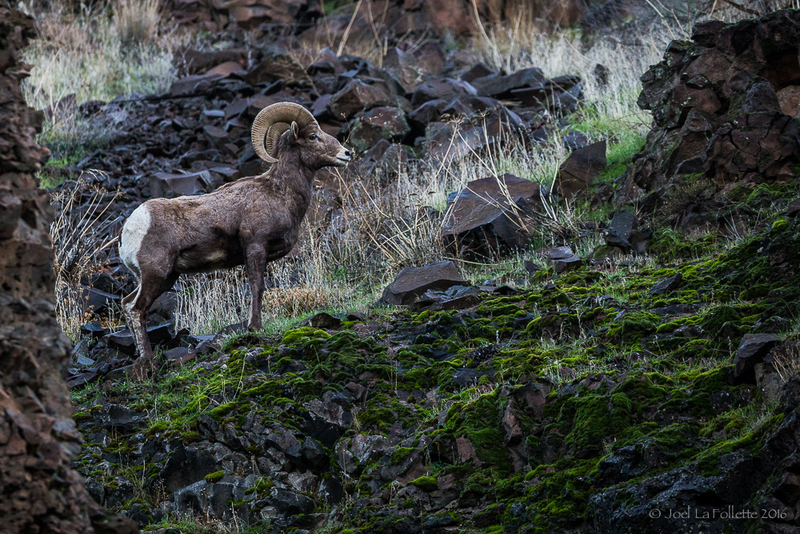 The basalt cliffs and towering rock faces of the canyon are their perfect habitat, but now the low lands provide food, water and warmth with only the occasional interloper. I come to the canyon now for the peacefulness of this time of year. There are still fish to swing for, but their numbers do not draw me. It is the quiet and solitude I enjoy. With the sun heading south for the winter, the light and shadows on canyon walls emphasizes the ruggedness of my surroundings. It’s like a fresh coat of paint on a familiar wall that awakens a memory or makes a new one. The River now sings to the canyon walls and the echo is undisturbed by manmade sounds. It seems proper to whisper if I must speak at all, and I have been known to talk to the river. There are many times as well when the river speaks to me.